Manhattan Prep’s TOEFL 5 lb. Book of Practice Problems is an essential resource for students of any level who are preparing for the TOEFL. 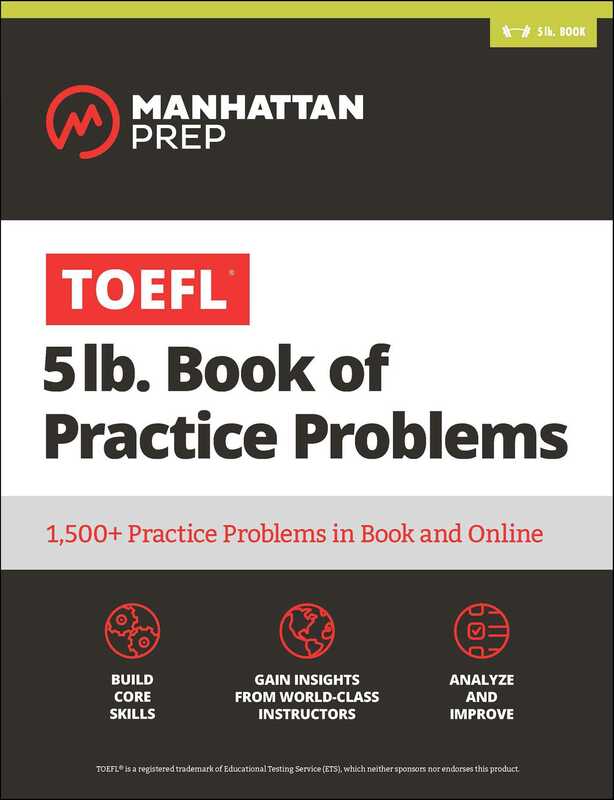 With more than 1,500 questions across 46 chapters in the book and in online resources, TOEFL 5 lb. provides students with comprehensive practice. Developed by our expert instructors, the problems in this book are sensibly grouped into practice sets and mirror those found on the TOEFL in content, form, and style. Students can build fundamental skills in Reading, Listening, Speaking and Writing through targeted practice, while easy-to-follow explanations and step-by-step processes help cement their understanding of the concepts tested on the TOEFL. In addition, students can take their practice to the next level with online question banks that provide realistic, computer-based practice to better simulate the TOEFL test-taking experience. Purchase of this book includes access to additional online resources and practice. Founded in 2000 by a Teach for America alumnus, Manhattan Prep is a leading test prep provider with locations across the US and the world. Known for its unparalleled teaching and curricular materials, the company’s philosophy is simple: help students achieve their goals by providing the best curriculum and highest-quality instructors in the industry. Manhattan Prep’s rigorous, content-based curriculum eschews the “tricks and gimmicks” approach common in the world of test prep and is developed by actual instructors with 99th percentile scores. Offering courses and materials for the GMAT, GRE, LSAT, and SAT, Manhattan Prep is the very best.